Clinical Supervision - Marci R.D. Marci Evans is an iaedp™ Certified Eating Disorders Registered Dietitian and Approved Supervisor (CEDRD-S). She is eager to support you in developing your own eating disorders expertise. Marci began supervising dietitians in the field of eating disorders when she hired her first employee in 2011. Since then it has grown into a professional passion. 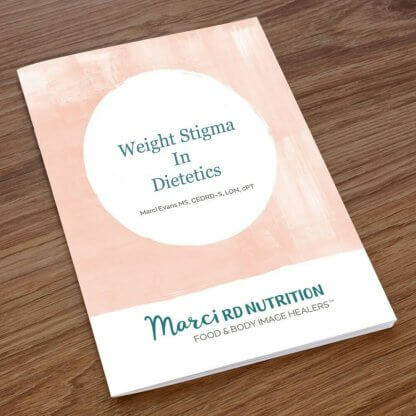 Through the management of her group practice, educating students and clinicians in her academic positions, and coaching individual dietitians Marci loves seeing her peers develop into stronger and more confident practitioners. While not common practice for registered dietitian nutritionists, it is the gold standard for counselors and therapists. Marci’s personal goal is for clinical supervision to become common practice for registered dietitians too! Essentially, clinical supervision entails working with a nutrition mentor you admire to help you develop and grow in your work. Marci considers it the fast track to becoming the best version of your professional self. She the poster child for clinical supervision! The beauty of clinical supervision is that the frequency and content is totally up to you! Most commonly, dietitians meet with Marci on a monthly basis. Topics of conversation include: guidance on stuck points and questions with your clinical cases, working through difficult team dynamics, review of current research, development of areas where you feel you are lacking, business coaching, perceived mistakes, as well as your successes. Marci provides 50 minute clinical supervision sessions virtually via video conferencing as well as in person in her office in Harvard Square. She offers individual clinical supervision as well as group supervision options. Currently her groups are full. However, if you would like to be added to a waitlist, have questions about pricing, or need more information about supervision please send a request on our contact page. She looks forward to connecting with you! How did you hear about Marci RD Nutrition? If you are interested in learning more about the courses I offer at The Food and Body Image Healers™ Online Training Institute, click the link below.